This post marks the first fashion related post on my blog. Yay! I’m still planning out how I want to incorporate those different categories, but I’m glad to get a post out. Here is what’s in my purse (and by purse, I mean my going out or going shopping purse—work purse is a whole different story) on a day-to-day basis. I’ve become very simple in my adult life with what I keep in a purse. I’ve got sunglasses (which usually are on my head, but occasionally sneak inside), chapstick, my keys, and my wallet. My wallet is literally as big as my purse, so depending on what I’m doing, I’ll just bring my I.D. and cash or a card. I’ll throw my phone in the side pocket as well, but if I’m being honest, my phone is usually in my hand or my pocket, so I didn’t feel like I needed to include it. I was also too lazy to get my camera out and needed it to take the picture. I’m very neutral with my accessories! I love black and browns because they will go with literally everything. This purse is from Target (last year, I believe) and is the one I use most! 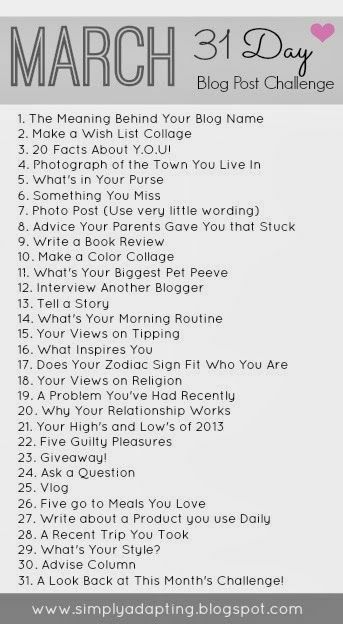 Join the blogging challenge with me! It’s a great way to keep consistent with writing and even jumpstart original ideas and content!